If you've been waiting your whole life to have a fancy big-kid version of your childhood treehouse, wait no longer. 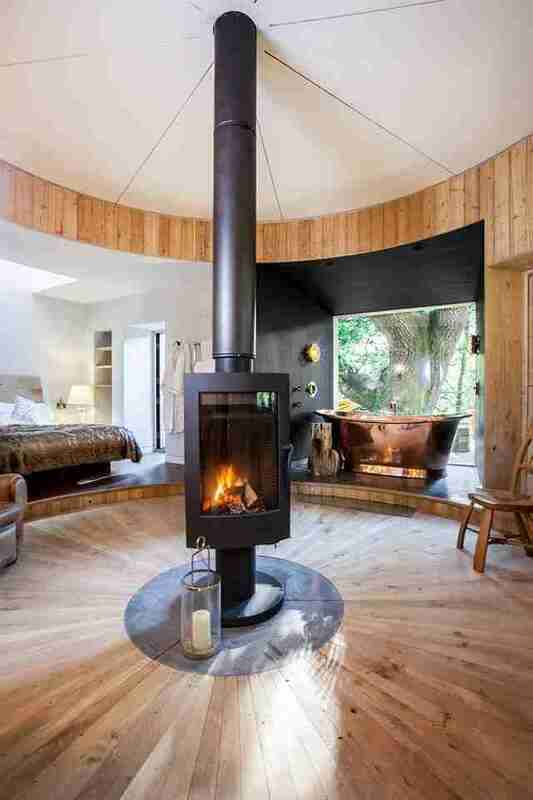 British designer Guy Mallinson has created a secluded luxury treehouse in Dorset called The Woodsman's Treehouse. 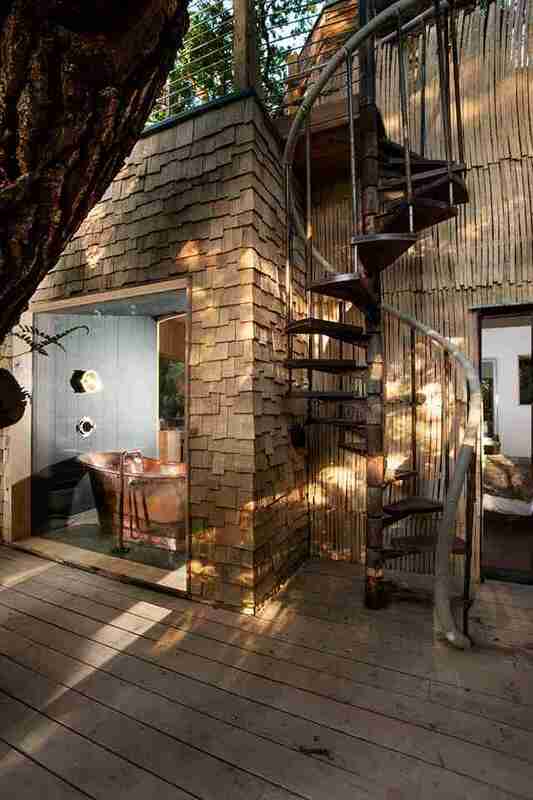 Luxury treehouses: a thing you didn't know existed until one minute ago, but now you of course want one, right? 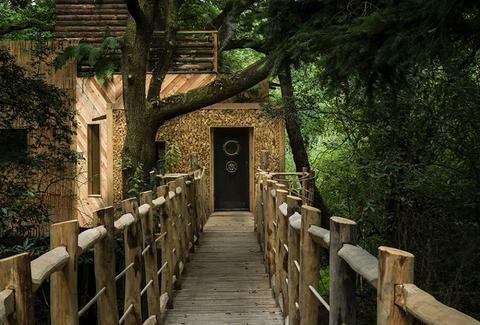 While you probably aren't going to buy your own vacation treehouse, the good news is that you can spend a night in this beautiful creation. 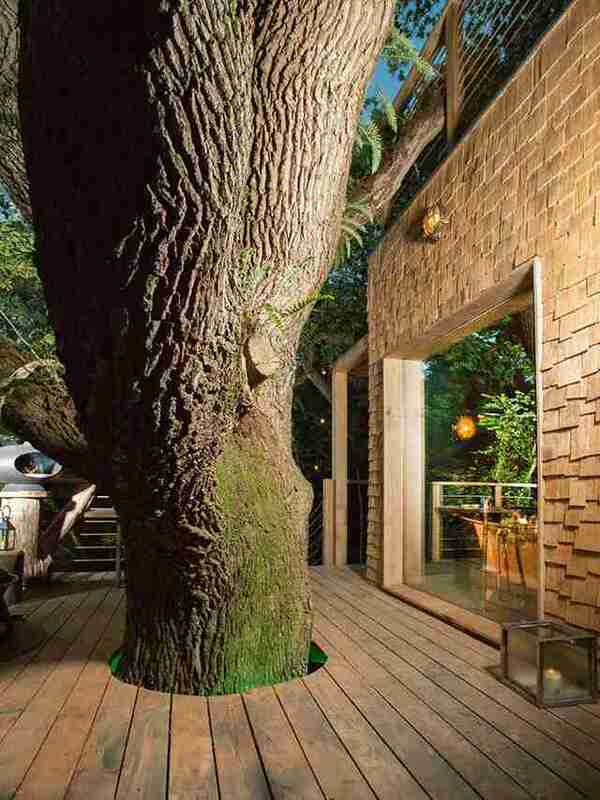 The two-story treehouse is sustainably built into a 200-year-old oak tree almost 30-feet up in the air. It took Mallinson five months to build and the attention to detail shows in how the construction is cognizant both of its surroundings and creating a one-of-kind experience for visitors. Despite being out in the woods, the finished product isn't anywhere near the phrase "roughing it." 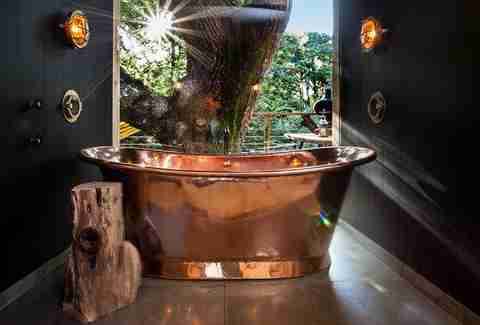 The treehouse features a copper bathtub, open air tree-shower, wood-fired pizza oven, and a revolving wood burner that can be directed toward the bed, sofa or bath. 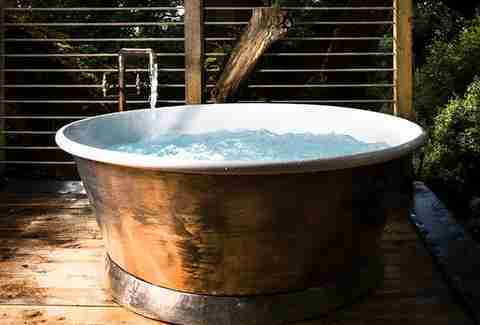 Up a spiral staircase from the main floor is where you find the rooftop deck, hot tub, and sauna. He also built in a stainless steel slide to get down, because it's a treehouse, dammit. 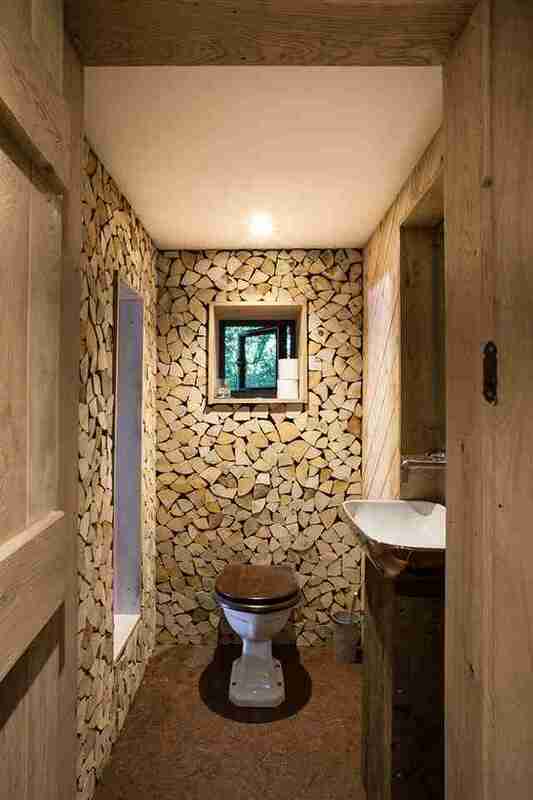 The structure was sustainably built with all the materials either being "found or made in the woods." The treehouse doesn't actually touch the trees near it either, allowing "rainwater to run down the stems and wildlife to travel up and down in the normal way, hence maintaining the delicate ecosystem of the oak tree." 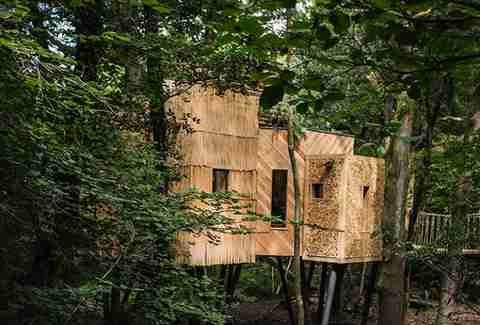 It maintains the appearance of a treehouse without being built into the tree. "We don't stress the trees by imposing heavy loads on them or by fixing bolts into them. We believe that the tree has grown in response to its environment and as such should be left well alone." 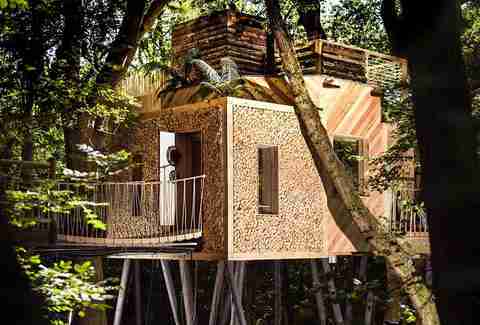 The treehouse rents for around $400 a night and, as you might expect, reservations are getting hard to come by. 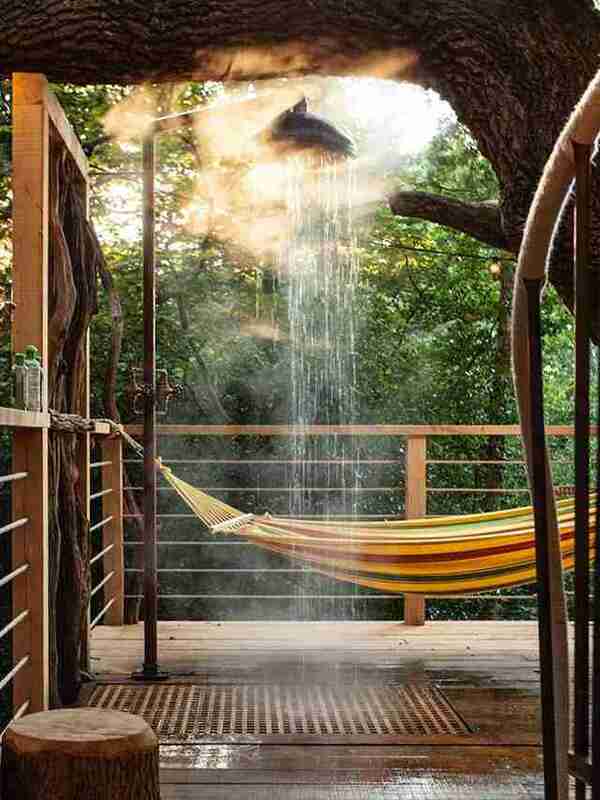 But if you're finding the treehouse irresistible, you can book a stay here.